London, UK and Amsterdam, the Netherlands - BTG plc (LSE: BTG), a global specialist healthcare company, and Royal Philips (NYSE: PHG; AEX: PHIA), a global leader in image-guided therapy, announced today a significant milestone in their collaboration with the treatment of the first liver cancer patient with LC Bead LUMI™ in conjunction with Philips live image guidance, targeting a hypervascular tumor with the goal to block blood flow to achieve tumor necrosis. Liver cancer is the second leading cause of cancer deaths in the world , and one of the most challenging to treat. Each year, more than 700,000 patients worldwide are diagnosed with liver cancer . Interventional embolization is an option for some patients with tumors that cannot be removed by surgery. The first patient treated signals the next stage in commercializing next generation embolic beads, which can be visualized during interventional procedures, allowing enhanced visualization to evaluate completeness of tumor treatment. As a result of the collaboration between BTG and Philips, for the first time doctors will be able to see rather than assume the location of the LC Bead LUMI™, in order to deliver their treatment with more confidence when treating liver cancer. "The aim with this new radiopaque embolic bead and visualization technology is to provide clinicians like me the ability to make real-time adjustments while conducting the embolization procedure, so that we can optimize patients&apos; treatment and hopefully improve targeting accuracy," said Bradford Wood, M.D., Director of the NIH Center for Interventional Oncology  and Chief of Interventional Radiology. "It is reassuring for the clinician and the patient to know that the treatment was delivered exactly where it was aimed, and where it was needed. Treating the first patient using LC Bead LUMI™ in combination with dedicated Philips 2D X-ray and 3D CBCT image guidance is a milestone in our public-private partnership with both of our industry research partners. The imaging of the beads during this first procedure was exquisite and provided valuable information." By enabling visualization of beads during an embolization procedure, LC Bead LUMI™ will help embolization technology achieve its full potential. LC Bead LUMI™ has been developed with revolutionary radiopacity technology in collaboration with Philips that enables real-time visualization of bead location during embolization. 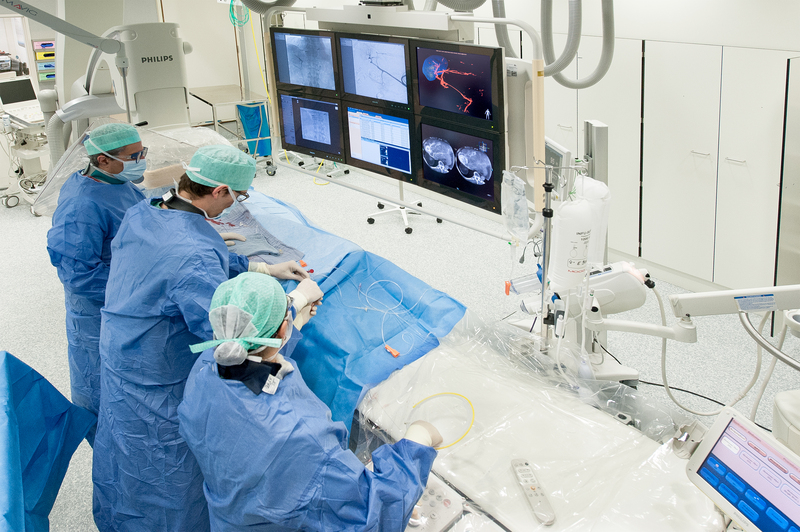 LC Bead LUMI™, supported by Philips live image guidance, has the potential to offer interventional radiologists more control, allowing enhanced visualization to evaluate the completeness of tumor treatment and end-point determination. "BTG continues to advance its leadership in Interventional Medicine by actively listening to our customers and providing creative solutions to meet their clinical needs," said Peter Pattison, Interventional Oncology General Manager, BTG. "Several years ago, we began scientific collaboration with Philips to evaluate the benefits of better image-guided therapy and this venture resulted in the ability to calibrate Philips&apos; imaging software to LC Bead LUMI™. The clinical impact of the BTG-Philips collaboration is now helping interventional radiologists and multi-disciplinary teams make enhanced treatment decisions for patients with liver cancer." "Minimally-invasive therapy procedures provide key benefits for healthcare systems and patients, and intelligent image guidance is an essential part of these procedures,” said Ronald Tabaksblat, Business Leader Image Guided Therapy Systems at Philips. “We aim to continuously improve Image Guided Therapy and our collaboration with BTG to provide enhanced visibility and guidance during interventional embolization procedures is another important milestone in this exciting journey to help deliver excellent treatment and enhanced patient care." LC Bead LUMI™ was cleared for clinical use in the US in December 2015 after extensive laboratory testing based on the clinical foundation of its predicate device, LC Bead®. BTG and Philips will showcase their advancements in interventional oncology at the upcoming symposium on Clinical Interventional Oncology (CIO), taking place on February 6 and 7, 2016, in Hollywood, Florida. For information on BTG, visit http://www.btg-im.com, and to learn more about Philips integrated solutions for diagnostics and therapeutic oncology, please visit https://www.philips.com/io.
. World Health Organization (WHO). Cancer factsheet. Available at: http://www.who.int/mediacentre/factsheets/fs297/en/. Last accessed January 25, 2016.
. American Cancer Society. What are the key statistics about liver cancer?. Available at: http://www.cancer.org/cancer/livercancer/detailedguide/liver-cancer-what-is-key-statistics. Last accessed January 25, 2016.
. NIH does not endorse or recommend any commercial products, processes, or services. The views and opinions of authors expressed here do not necessarily state or reflect those of the US Government or the NIH, and they may not be used for advertising or product endorsement purposes. Royal Philips (NYSE: PHG, AEX: PHIA) is a diversified health and well-being company, focused on improving people's lives through meaningful innovation in the areas of Healthcare, Consumer Lifestyle and Lighting. Headquartered in the Netherlands, Philips posted 2015 sales of EUR 24.2 billion and employs approximately 104,000 employees with sales and services in more than 100 countries. The company is a leader in cardiac care, acute care and home healthcare, energy efficient lighting solutions and new lighting applications, as well as male shaving and grooming and oral healthcare. News from Philips is located at https://www.philips.com/newscenter. BTG Interventional Medicine is part of BTG plc, a growing international specialist healthcare company. As medicine moves from major surgery to minor procedure, from the systemic to the local, no company endeavors to do more than BTG Interventional Medicine to help doctors in their quest to see more, reach further and treat smarter. Our growing portfolio of Interventional Medicine products is designed to advance the treatment of liver tumors, advanced emphysema, severe blood clots, and varicose veins. To learn more about BTG Interventional Medicine, please visit: www.btg-im.com. LC Bead LUMI™ is the first commercially available radiopaque embolic bead cleared by the US Food & Drug Administration (FDA) for the embolization of hypervascular tumors and arteriovenous malformations (AVMs). LC Bead LUMI™ provides visible confirmation of bead location during AVM procedure. The lasting radiopacity of LC Bead LUMI™ means they will also be visible in follow-up scans. To register for more information, please visit: www.LCBeadLUMI.com.